A few weekends ago I lived this hockey lover’s dream: two games in less than 24 hours played by my two favorite teams. Unfortunately, these games marked the end of disappointing seasons for the Flyers and their minor league affiliate Phantoms given that neither team made the playoffs. But being a fan means enjoying seeing your team play no matter what, so I was excited to attend my first Leigh Valley Phantoms game and my last Philadelphia Flyers game of the season. My husband, who grew up near Allentown, eagerly watched the Phantoms’ new arena, PPL Center, being built over the last few years via the Phantoms’ live cam at the construction site. He and I were very excited to attend a game in the new arena and had booked a room in the beautiful Renaissance Allentown Hotel that is part of the arena complex. PPL Center did not disappoint and I now understand why Flyers GM Ron Hextall once joked that the Flyers players didn’t mind so much getting sent down to the Phantoms given the beautiful new arena and its amenities. Though I was excited about seeing the new arena, I was most excited about seeing the Phantoms play. I had seen them play two years ago when they were the Adirondack Phantoms visiting the Hershey Bears. Getting to Adirondack to see them play was never going to happen, but I had kept up with how the team was doing. And because I keep track of the Flyers prospects, I found that I was familiar with most of the players on the Phantoms roster. In fact, I had seen several of them play for the Flyers this season. One of the things I like most about minor league hockey is the smaller arenas and thus the closer proximity to the ice. We sat on the seventh row by one of the goals, but it felt as if I could jump into the face-off circle if I wanted to. Hockey is one of those sports that is best appreciated in person, and most perfectly appreciated up close in person. The game is fast and intense, and I don’t think that fact is truly appreciated until one sees (and hears) it firsthand. After seeing dozens of NHL games and a handful of AHL games, I am convinced that AHL games are what I would call more “brutal.” The intensity and physical play seems higher in the AHL than in the NHL (excluding the NHL playoffs, which are definitely a step up in intensity). I am probably not the first person to point out this difference between the AHL and the NHL, and I am not exactly sure why it is true, but I suspect that is has to do with where the players are in their careers. The AHL players are talented for sure (though maybe at more varying levels than in the NHL), but each one is fighting hard each night to prove that he deserves to play in the NHL. The NHL players, on the other hand, are likely more evenly matched in skill level and do not have as much to prove since they now have the coveted NHL contract in hand. As a fan who appreciates the physical play of the game, I find the AHL game quite thrilling. The other aspect of the AHL game that I really enjoy is getting the chance to evaluate future Flyers. Finally, thanks to Ron Hextall’s sound plan to rebuild the Flyers from within, the Flyers farm system is starting to get flush with prospects. A few of those highly touted prospects played for the Phantoms this year and will hopefully have a shot at playing for the Flyers next season. One of those prospects is Scott Laughton, who spent time with the Flyers this season. He did not disappoint in this Phantoms game. He scored the Phantom’s only goal in regulation and won the game for the Phantoms in a thrilling shootout. Here’s hoping he is with the Flyers all of next season if for no other reason than to slay the shootout beast that continues to befall the Flyers. Fortunately for the Flyers, the defensive prospect depth chart is starting to look deep (and big). Another Phantoms defenseman who saw some time with the Flyers this season is Oliver Lauridsen. At 6’6”, when he is on the ice he towers above almost every other player. As I continue to try to learn more nuances of the game, I spent one of Lauridsen’s shifts watching only him in order to study a defenseman’s every move on a shift. He never stopped working, and he disrupted or blocked at least four shots during that shift. I found myself wondering why he wasn’t in Philly all year. Hopefully he will get his chance in the upcoming season. The Phantoms and the Admirals were tied 1-1 at the end of the third period and went into a five-minute four-on-four overtime. I had no idea how much taking two opposing players off the ice would open things up. Lots of shots on goal ensued, but the game was still tied after OT. Then came the shootout. If it were a Flyers game, I would have gone ahead and conceded a loss considering their dismal performance in shootouts. But I knew the Phantoms had a better shootout win percentage, and I had seen them win a shootout in a televised game over the holidays. They did not disappoint as Laughton sneaked the puck past the Admirals’ goalie and skated back to his jubilant bench having sealed a Phantoms victory. The next morning my husband and I got an early start and headed to Philly for the Flyers season finale at Wells Fargo Center that afternoon. 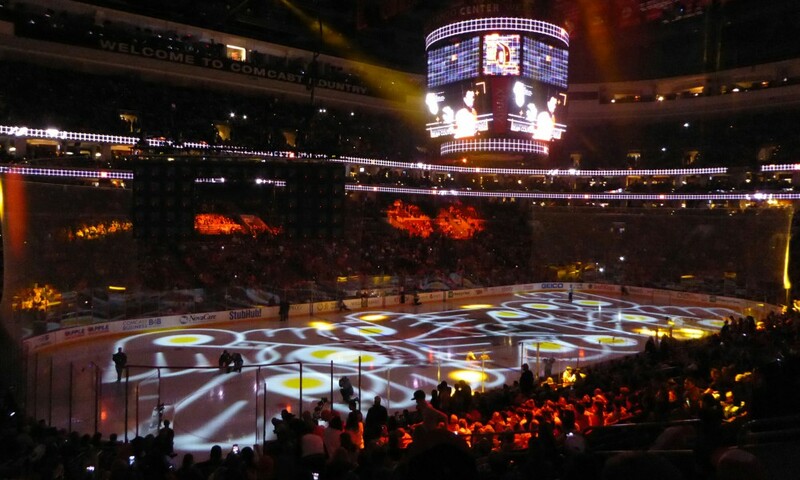 It was surreal to think this was the last time we would be at a Flyers game for months. In the same way, though, the season-ending break seemed necessary. Wipe the slate clean and start over again in October with hopes of a better season. As the Flyers came onto the ice for their pre-game warm-up we saw two familiar faces: Jason Akeson and Mark Alt, who had both played for the Phantoms the previous night, had made the trip to Philly to play in this game (and would be sent right back to Lehigh Valley after the game). The game seemed like so many other Flyers games this season. The Flyers looked capable of beating the Ottawa Senators, but then came the defensive lapses that left goalie Steve Mason vulnerable, and soon the Flyers were on the wrong side of the score. Matt Read scored to tie the game in the second period, but soon the Senators were leading again. Before I knew it, my husband and I were exiting the arena with only a few minutes left in the third period. As we listened to the end of the game on the radio it hit me like a ton of bricks. The season was over. No more Flyers hockey. I was stunned….and depressed. What would I do without hockey? But then I thought of the calendar: draft in two months, preseason camp three months after that, and all of the hockey news that would occur between now and then. The 2015-16 hockey season would be here before I knew it.